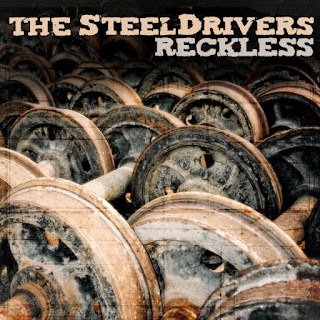 Craft Recordings is pleased to announce the first-ever vinyl release of the critically acclaimed sophomore album from The SteelDrivers, Reckless. Picking up where the band's eponymous debut leaves off, Reckless (first released in 2010) is the Nashville group's last album with singer/songwriter Chris Stapleton at the helm, who left the band later that same year to pursue his solo career. The album earned The SteelDrivers two GRAMMY® nominations--for "Best Bluegrass Album" and "Best Country Performance by a Duo or Group with Vocals," courtesy of its song "Where Rainbows Never Die"--and saw the band continue to push the boundaries of bluegrass incorporating experimental aspects from other genres, including blues and Southern soul. The SteelDrivers' story began in the late summer of 2005, when Tammy Rogers, multi-instrumentalist Mike Henderson, bass player Mike Fleming, banjo player Richard Bailey, and singer/guitarist Chris Stapleton first convened after a series of songwriting sessions between Henderson and Stapleton. What began as a casual get-together to jam, became a fully committed band that signed with Rounder Records in 2007. Since that time, The SteelDrivers' innovative, soulful brand of bluegrass has made them one of the most successful bands on the contemporary bluegrass scene. Reckless was produced by Luke Wooten (who also produced the debut album) and includes live favorites such as "Where Rainbows Never Die" and "Ghosts of Mississippi." The genre boundaries pushed in their self-titled debut are stretched further here, as The SteelDrivers imbue their Nashville bluegrass style with a dosing of traditional blues and Southern soul. Since Reckless' 2010 release, the band--now consisting of frontman Kelvin Damrell, fiddler Tammy Rogers, bassist Mike Fleming, mandolinist Brent Truitt and banjoist Richard Bailey--has released two more albums, including, most recently, 2015's The Muscle Shoals Recordings, which reached #1 on the Billboard Bluegrass chart, won the band a GRAMMY® Award for Best Bluegrass Album and also received IBMA nominations for Album of the Year and Song of the Year ("Long Way Down"). The band are currently on an extensive North American tour--see below for dates and more information. Pre-order Reckless on vinyl HERE.